Small Blemish - To COVER SMALL BLEMISH on face, pinch a hole in a tissue and use as a shield and spray in short, light bursts using low pressure (5 to 8 lbs.). 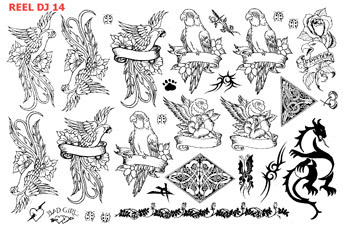 This sheet contains: Roses, Flowers, Eagles, Parrots, Lady Bugs, Tribal, Dragon, Celtic, Scrolls, 'Bad Girl', Rose, Chain, Cherries, Paw Print. Sold by the sheet only.